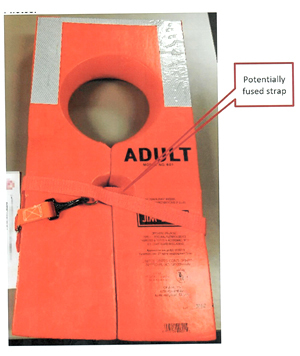 NORTH HOLLYWOOD, CA, June 22, 2019 – The following is a notification from Cal-June Inc. that the Model 601 and 603 life vests identified below may not be able to be donned properly. This is due to a potential condition where the movable strap may be fused to the vest preventing proper donning (see Photo). The life vests are typically sold for use on commercial vessels. Hazard: The movable strap may be fused to the vest, preventing proper donning. Remedy: Cal-June Inc. recommends that you stop using this product should this condition be encountered and replaced with a suitable alternative life jacket. JIM-BUOY Model 603 Child Type 1 life jacket Manufacturer:	Cal-June Inc. of North Hollywood, CA Hazard:	The movable strap may be fused to the vest, preventing proper donning. Remedy:	Cal-June Inc. recommends that you stop using this product should this condition be encountered and replaced with a suitable alternative life jacket. Cal-June Inc, Highly Recommends that JIM-BUOY Model 601 and Model 603 life jackets be inspected Immediately and Semi-Annually thereafter to ensure that the movable strap is not fused to the vest.